Updated 11/2016. The pair of tough little Broan-NuTone Big Heat Heaters were fished out of storage for yet another season of heating my RV. Best money I ever spent on heaters. The last 2 weeks have seen some morning temps in the low 40’s here north of Newton, TX. It got me to thinking where I had stored the winter coats and vests. It is getting to be that time of year. This year marks the fifth year I have wintered over full time in my RV. The Recreation Vehicle Forums are full of questions this time of year about winterizing the RV, keeping water lines from freezing, heating the basement and storage areas and just keeping warm. 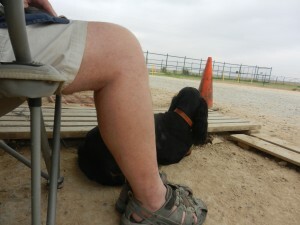 Fulltimers don’t winterize so I am going to tell you how I cope with moderate winter weather here in Texas. Heating your recreational vehicle economically and efficiently can be a challenge. 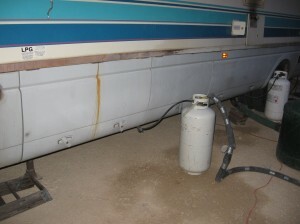 The RV furnace is a noisy propane hog and most full time RV residents do not rely on it as a primary source of heat. The onboard RV furnace can also be a bit temperamental at times. It utilizes a sail switch which makes sure the fan is running full speed before it allows propane to flow to the furnace. A low battery, a defective switch, dirt dauber nests and a variety of other things can contribute to problems with the RV furnace. If you are boondocking during winter months, the battery drain of your recreational vehicle furnace can deplete a battery bank quickly. Some full timers rely on electric heaters and some use auxiliary propane heaters like a Buddy Heater. Some lucky ones with high end coaches have hot water heating systems like an Aqua Hot. My normal habit on MyOldRV is to tell you what works for me, not what I have read on the internet ‘somewhere’, so let’s get started. Back in March, I wrote about my heating setup when I had to drag all the heaters out during a Spring cold snap. Most of us have two power sources available for heating. Propane as a source of heat. Propane is a great heat source and usually reasonably priced. You have to have a supply of propane anyway to run the hot water heater and refrigerator (if you are boondocking). The problem with propane is onsite supply. If you are a snowbird in an established RV park, most propane suppliers will readily rent you a large external tank for the season and keep it filled. If you are like me and that option is not feasible, you have to come up with a way to replenish your propane supply without breaking camp and going to town every time you run low on propane. Trailers and Fivers do not have this problem as most models come with dual external propane tanks and an automatic change over regulator. Brass. The Extend A Stay gives you the option of running an external tank as a propane source for all of your onboard propane devices. I use 2 Extend a Stays — one for the refrigerator, stove and furnace and the other one for my Generac propane generator. I have been fortunate in finding several used external tanks on Craigslist for little to nothing. They are also available new at Lowes, Home Depot or Tractor Supply. A 40 lb tank which as a 9.7 gallon capacity is a nice size. Not too heavy and easily portable, they will generally fill to around 8 gallons of propane at the recommended 80% capacity. As mentioned earlier, my Suburban propane furnace is a noisy propane hog but I would never consider removing it. I use it for a backup and for a quick warmup on particularly chilly mornings. Normal usage is setting the thermostat at around 45 – 50 degrees and just leaving it. Sometimes it will come on briefly during the coldest nights when my other heat sources can’t keep up. There are a wide variety of portable propane heaters. I use a Mr. Heater Little Buddy heater. That model is now called the MH9bx. The Mr Heater products come two different ways and you need to be aware when you purchase one. The Little Buddy has its’ own propane regulator. You can connect it directly to an external tank or use one of those little green bottles as a propane source. 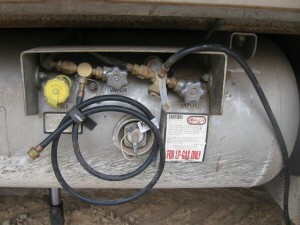 The larger heater uses a regulated propane supply. Many people put a T connector in the propane supply line for their stove with a quick disconnect for the larger heater. I have a 15′ rubber supply line that runs down through a cargo bay and then outside. I connect my Little Buddy to an external tank and I am all set. Many people view the Mr Heater products as a safety hazard since they deplete the oxygen supply in an enclosed unit and produce a small amount of carbon monoxide. The heaters have a low oxygen shutoff sensor and I normally run mine with a window or roof vent slightly open. I have never been concerned about any of the safety aspects. I do have two CO detectors installed in the Old Girl. I do not generally run the Little Buddy when I am sleeping. One of the features I wish the Little Buddy had was a thermostat. It has a Low/High heat setting but it is either on or off. I generally keep the Little Buddy close to my work area or where I am watching TV. It sure does keep me cozy and will run up to 110 hours on a 20lb tank. Whether you use electricity or propane as a source of heat is largely dependent on cost. If you are paying for both sources, you can do a BTU comparison and decide which one is the most economical. I don’t pay for electricity on any of our job sites so it is a no brainer for me. 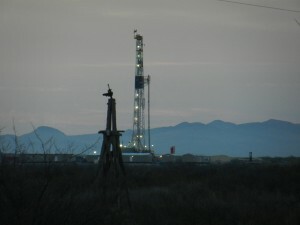 We normally get the power installed on a new job site and the location here north of Newton, TX is no exception. When the electrician came to hook up the power, we had 4 50amp RV boxes installed and 4 all weather 20amp household type receptacles put in on the pole as well. Regardless of whether your 110v electric heater is ceramic or quartz , electric coils or oil bath, maximum output is going to be 1500 watts. Period. On the 30 amp Old Girl, all of my 110v outlets are on a single 20amp general purpose breaker. If I run an electric heater at 1500w, it will flip the breaker. If I run 2 electric heaters at 750w each, it will eventually flip the breaker. I am limited to running one electric heater at 750w. Remember the 20amp receptacle on the pole? I run a 12ga extension cord to the pole and then into the electrical compartment on the Old Girl. I ran a 10ga line several years ago from the electrical compartment to the front of the Bus and it terminates in heavy duty surge protected power strip. It is a nice source of additional power and I dedicate it to an electric heater during the winter. It will run a 1500w heater at max setting with no problem. I use two electric heaters routinely in my recreational vehicle. One is an oscillating ceramic tower heater with remote control that sits between the two seats in the driver’s compartment. The other one is a simple little electric cube heater with manual controls. I tried different combinations and eventually settled on this setup. Many people love the oil filled radiators but I found them to be ungainly and awkward and they get hot when you try to move around them in a confined space. The absence of a fan to circulate the heat killed the radiator for me. The little cube heater is the most flexible. I can sit it close to where I am to provide a zone of warmth, I can move it to the bath so I don’t get chilly when I take a shower. The use of a manually controlled heater is mandatory as well. More on that in the next section. I am fortunate that winter temps very seldom dip into the single digits. Normally, we see high 20’s to 30’s as average night time temps here in Central Texas. I do not have a heated basement but the openings to the basement from the living area allow a good amount of heat to go down there. As long as I am in residence, I do not take extreme measures when the temperatures dip. I do not use a city water supply during the cold months. I fill the onboard water tank and use that; alleviating the problem of insulating or heating my water hose. During the holiday season, I generally go to the stick house in Dallas for up to 30 days at a time. I do take precautions when I leave for that length of time. I open the cabinets under the kitchen sink and bathroom vanity. I close all the shades. I set the Suburban furnace at 40 degrees. I set the cube heater with the manual controls at 60 degrees. The electronic controlled heaters like the ceramic towers are wonderful but if you have a power outage, they will NOT come back on! I turn off the water pump. I turn off the water heater. If particularly cold weather is expected, I place 60 watt trouble light in the two storage compartments which contain plumbing. I switch to the onboard 40 gallon propane supply which is always kept full. UPDATE! Hard to believe it has been 5 years since this post was written! I am still using the same Mr. Heater I had back then. I am wiser and more experienced when it comes to electric heaters. 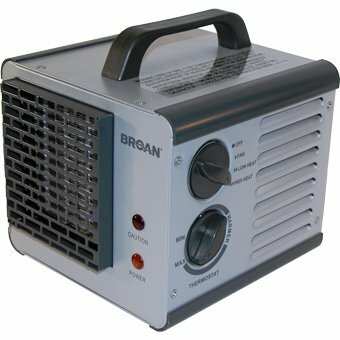 The ONLY electric heater I will recommend these days is the Broan-NuTone Big Heat Heater . 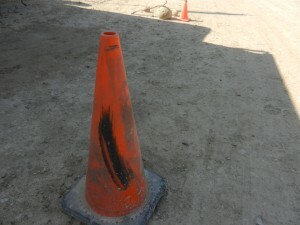 You are going to think what is the BIG deal when you see one of these. They are small with no bells and whistles but I will tell you right now they DO THE JOB and then some. My oldest one is going into its’ 5th winter and I just bought a 3rd one. Every one of these heaters is still in service! 2 of these are heating the Palace this morning at 34 degrees with a stiff north wind whipping outside. Looking for a GOOD electric heater?????? Well, here ya go! A 1500 watt heater will draw 12.5 amps and alone, it will not over load a 20 amp (or a 15 amp) circuit and trip a breaker. 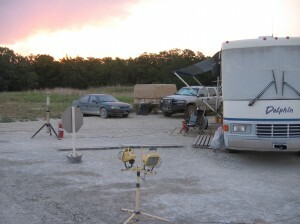 We regularly run two 1500 watt heaters in a 30 amp RV. Just be sure that each heater is on s different circuit. A 30 amp RV will usually have a pair of 15 or 20 amp breakers installed. If you go to run another applaince on the circuit with the heater, it will trip once you exceed the 15 or 20 amp breaker limit. So turn off the heater while you run the microwave, coffee pot, toaster, etc. If you are tripping a 20 amp breaker with a 1500 watter (12.5 amp) heater, you have a weak breaker or some other load on the circuit. I have ONE 20amp circuit that runs all the 110v outlets on the Old Girl. Forget electric and propane for additional heating systems in your rig, get a espar webasto or Snugger brand diesel heater. .3 liters fuel per hour, .5 amp draw at 12 volts 7200 btu of constant quiet heat. I heat a 40 foot four slide fifth wheel with it, in the coldest months I save 300 on propane. Trlr always one constant temp, heat duct mounted at floor level, nice warm floor 24/7. 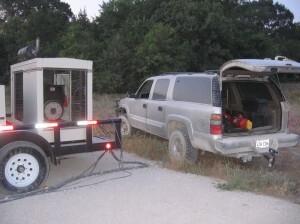 I also use portable tanks to bring propane to my rig, i use ones that are really big that hold 23 gallons and I installed a direct vent propane heater that uses no electricity and uses outside air for combustion, the exhaust goes outside so no CO2 issues but it takes up wall space and you will be lucky to find a big enough place along an outside wall to put one.I have one hose for the heater direct and one hose for the rest of the coach and its two furnaces which work well but are noisy. the direct vent is silent. One BIG problem here. I have NO electricity, it seems today that everyone assumes that we all have it. I need the OLD style direct vent furnace, I have one in my 1973 Lil Hobo, and I LOVE it. I use solar power, and can’t afford to run a fan all night when all I need is heat. But I can’t seem to find any anywhere. I use 2 infrared heaters in my fifth wheel and another in my basement during the winter months. These units give out great heat but impossible to catch anything on fire, always cool to the touch. Availble on Amazon.com. I run a 1500 water in my living room and a 800 watt in the bedroom and basement. They come with remote controls and digital temperature read-out. Brands are Lifemart and Source Green and cost between $80 to $150. These units pull very little electricity and have never thrown an 15amp breaker in my 50amp 5th wheel. My Lifetime 1500 watt unit fit between my two recliners and makes a great end table….never gets hot on the outside of heater and heats my 36′ 5th Wheel very toasty. I have a 800 watt in my basement and keeps it 70 degrees in 15 degree outside temperatures. Never have any water freezing problems with these units. I almost never use my propane furnace because of the cost and trouble switching and filling tanks. I keep my two propane tanks full mainly for a backup. These units will keep your rv very warm. 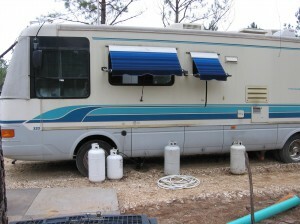 I have dual pane windows and Arctic package on my 2006 Monaco McKenzie Lakota Estate 5th Wheel. I also place a remote temperature monitor in my basement so I can check the temp at any time which gives me piece of mind. I use a “Acurite” monitor which are available at Walmart, Lowes or Home Depot. They work up to 150′ away from the sensor. They give the current temperature and humidity from the sensor location plus current temperature and humidity from wherever you have the readout places in your coach. is it a infrared quartz heater? I’m looking at a Lifesmart 1500 Sqft 1500 Watt Infrared Quartz Heater 6 Element w/ Remote on Amazon. Faced with a power outage, I have parked my rv at home. Plan on running the propane heater in the RV. How often and how long will I have to run the generator to keep the batteries up to run the electrical requirements of the propane heater? I would not let the batteries fall below 12.2 volts. Thanks for some great info! I wanted to chime in on the Broan Heater. You’ve had far better luck than I did. I got two winters out of my first one, and most of one winter out of my second one. Loved it, for a while. But they’re bad to collect dust and animal hair (if you have one) inside the blower, which will shut them down. Taking apart and cleaning is no fun. I was frustrated after $100+ down the drain, and then I remembered my old friend – my Pelonis Ceramic Disk Furnace from the late 80’s. Yep, you read it right – it’s 25 years old. I remember choking on the $170 price tag at the time, but it turned out to be more than worth it. These little things were built like a brick you-know-what, and even had a five year warranty! I fell in love with it again, using it all last winter, often 24/7 without a whimper. You can find them often on eBay, but you have to be careful. The best ones were the early ones, made in 1987 to 1990. After that, it’s not the same product from what I read. There is a silver label on the bottom with mfg. date. The two I bought off eBay, for backups, also work perfectly. Figure about $50, depending on how nice they are and how cold it is when you bid. Just a little tip from a fellow full-timer. Thanks for the tip Joe. Just bought a 32′ Teton. It has the winter package. Will be living in it. Winters are very cold in North Dakota. What is the best way to heat it and cheapest. I have never own a RV before. I have insulated skirting. What is best heater to heat it underneath.